In biochemistry, eicosanoids (preferred IUPAC name icosanoids) are signaling molecules made by oxidation of 20-carbon fatty acids. They exert complex control over many bodily systems; mainly in growth during and after physical activity, inflammation or immunity after the intake of toxic compounds and pathogens, and as messengers in the central nervous system. The networks of controls that depend upon eicosanoids are among the most complex in the human body. Eicosanoids are derived from either omega-3 (ω-3) or omega-6 (ω-6) fatty acids. In general, the ω-6 eicosanoids are pro-inflammatory; ω-3s are much less so. The amounts and balance of these fats in a person's diet will affect the body's eicosanoid-controlled functions, with effects on cardiovascular disease, triglycerides, blood pressure, and arthritis. There are multiple subfamilies of eicosanoids, including the prostaglandins, thromboxanes, and leukotrienes, as well as the lipoxins and eoxins, and others. For each, there are two or three separate series, derived from either an ω-3 or an ω-6 EFA. These series' different activities largely explain the health effects of ω-3 and ω-6 fats. Current usage limits the term eicosanoid to leukotrienes (LT), eoxins (EX), and three types of prostanoids—prostaglandins (PG), prostacyclins (PGI) and thromboxanes (TX). This is the definition used in this article. However, several other classes can technically be termed eicosanoid, including the hepoxilins, resolvins, isofurans, isoprostanes, lipoxins, epi-lipoxins, epoxyeicosatrienoic acids (EETs) and endocannabinoids. LTs and prostanoids are sometimes termed 'classic eicosanoids' in contrast to the 'novel', 'eicosanoid-like' or 'nonclassic eicosanoids'. The EPA-derived prostanoids have three double bonds, (e.g., PGG3, PGH3, PGI3, TXA3) while its leukotrienes have five, (LTB5). The AA-derived prostanoids have two double bonds, (e.g., PGG2, PGH2, PGI2, TXA2) while its leukotrienes have four, (LTB4). Cyclooxygenase, or COX, generates the prostanoids from arachidonic acid. Lipoxygenase, or LOX, in several forms. 5-Lipoxygenase (5-LO) generates the leukotrienes from arachidonic acid and via transcellular biosynthesis is also involved in lipoxin generation. 15-Lipoxygenase generates the eoxins. Eicosanoid biosynthesis begins when a cell is activated by mechanical trauma, cytokines, growth factors or other stimuli. (The stimulus may even be an eicosanoid from a neighboring cell; the pathways are complex.) This triggers the release of a phospholipase at the cell membrane. The phospholipase travels to the nuclear membrane. There, the phospholipase catalyzes ester hydrolysis of phospholipid (by phospholipase A2) or diacylglycerol (by phospholipase C). This frees a 20-carbon fatty acid. 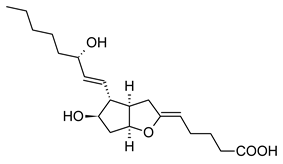 This hydrolysis appears to be the rate-determining step for eicosanoid formation. The fatty acids may be released by any of several phospholipases. Of these, type IV cytosolic phospholipase A2 (cPLA2) is the key actor, as cells lacking cPLA2 are, in general, devoid of eicosanoid synthesis. The phospholipase cPLA2 is specific for phospholipids that contain AA, EPA or GPLA at the SN2 position. Interestingly, cPLA2 may also release the lysophospholipid that becomes platelet-activating factor. Oxidation by either COX or lipoxygenase releases reactive oxygen species (ROS) and the initial products in eicosanoid generation are themselves highly reactive peroxides. LTA4 can form adducts with tissue DNA. Other reactions of lipoxygenases generate cellular damage; murine models implicate 15-lipoxygenase in the pathogenesis of atherosclerosis. The oxidation in eicosanoid generation is compartmentalized; this limits the peroxides' damage. The enzymes that are biosynthetic for eicosanoids (e.g., glutathione-S-transferases, epoxide hydrolases, and carrier proteins) belong to families whose functions are involved largely with cellular detoxification. This suggests that eicosanoid signaling might have evolved from the detoxification of ROS. The cell must realize some benefit from generating lipid hydroperoxides close-by its nucleus. PGs and LTs may signal or regulate DNA-transcription there; LTB4 is ligand for PPARα. See Leukotriene#Biosynthesis and Eoxin#Human biosynthesis. The enzyme 5-lipoxygenase (5-LO) uses 5-lipoxygenase activating protein (FLAP) to convert arachidonic acid into 5-hydroperoxyeicosatetraenoic acid (5-HPETE), which spontaneously reduces to 5-hydroxyeicosatetraenoic acid (5-HETE). The enzyme LTA synthase acts on 5-HPETE to convert it into leukotriene A4 (LTA4), which may be converted into LTB4 by the enzyme leukotriene A4 epoxide hydrolase. Eosinophils, mast cells, and alveolar macrophages use the enzyme leukotriene C4 synthase to conjugate glutathione with LTA4 to make LTC4, which is transported outside the cell, where a glutamic acid moiety is removed from it to make LTD4. The leukotriene LTD4 is then cleaved by dipeptidases to make LTE4. The leukotrienes LTC4, LTD4 and LTE4 all contain cysteine and are collectively known as the cysteinyl leukotrienes. The figure shows the ω-3 and -6 synthesis chains, along with the major eicosanoids from AA, EPA and DGLA.